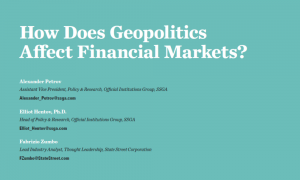 How Does Geopolitics Affect Financial Markets? This article is sponsored by State Street Global Advisors. In Alexandre Dumas’s 1844 novel The Count of Monte Cristo, news of an impending cross-border revolution in Spain leads to financial panic among French investors. Some investors end up selling Spanish bonds at a great loss, only to see the price bounce back after the news proves to be erroneous. Geopolitics matters to markets in the real world too and has been a major theme in 2018, as the post-war global order is dismantled and protectionism takes hold. But, as in Dumas’ tale, it can be hard for investors to know how to react to such uncertainty. In this paper, we examine attempts to assess the impact of geopolitics on markets and conduct our own analysis on how it plays out over different time periods. Our hope is that investors can use this analysis when considering how best to respond to future geopolitical events, in terms of both the risks and opportunities they may present. Thanks for filling out the form. You can download the report below.